Want to visit the Grand Canyon this summer? Planning a trip to this immense national treasure can be overwhelming as there are so many places to visit and its all spread out. Use this Guide to the North Rim to help decide which side of the Canyon you want to visit and to plan your stay. I graduated from Law School in 2016 and spent all summer cooped up in my house studying for the Texas Bar Exam. For my post-bar trip, I wanted to get away, be outdoors, and experience something exciting. My husband had never been to the Grand Canyon and I visited the South Rim when I was little, so it seemed like the perfect destination. We chose to drive because it gave us more flexibility and we could pack as much gear as we wanted. Here is everything we did during our 4 Day Stay at the Grand Canyon’s North Rim! The North Rim of the Grand Canyon is surrounded by a National Forrest and requires at least an hour drive from the nearest highway to reach the visitor’s center. The small parking lot fills up fast, so if you want to enjoy your visit to the North Rim, I recommend spending at least two full days at the park. Spend less time getting to the Canyon and more time exploring it! The North Rim Opens May 15, 2018 and closes on October 15th. The North Rim is closed during Winter months due to extreme weather conditions. We were told that snow accumulation on the north rim has been so sever that the lodge has been covered completely. This leaves a narrow window of time to visit the North Rim, and if you plan on staying there you better plan ahead! There are two main options for staying at the North Rim: campsite or cabin. Once again, you need to plan your visit ahead of time because you’ll need to make reservations. There is only one campground in the park and a limited number of cabins. To reserve a cabin, click here! To reserve a campsite, click here! If you prefer a less rustic stay at the North Rim, you can reserve a room at The North & South Motels. These rooms are located between the cabins and campground. To reserve one of the “motel” rooms, click here. We stayed in one of the cabins on the Transcept Trail side. We were there during the first week of August and the weather was perfect. Also, there weren’t a lot of people either, which is the best part about visiting the more rustic end of the Grand Canyon. The cabins have no AC, two small beds, and a tiny bathroom — the essentials. We slept with the windows open and earplugs in! The cabins along the Bright Angel Trail are a little larger, but there are fewer of these and may be more difficult to reserve. Tip: the lower the cabin number, the closer to the Canyon and the Lodge the room is! The larger cabins are in the 300 range, with room 301 being closest to the West Terrace. One of the reasons I recommend staying longer than one day is, if you plan on hiking any of the trails, you’ll need time to acclimate to the elevation. We drove from South Texas to New Mexico, where we stayed the night, stopped at the Navajo bridge outside of the Grand Canyon, and finally arrived in the early afternoon at the North Rim. We walked from the Lodge to the General Store in the campground and we found ourselves breathing pretty heavily. That 1/2 mile mini-hike was our warm up for the next day’s hiking, which was our warm up for the difficult hike we did on our last full day at the Grand Canyon. If we were to do anything differently, we would’ve added one more day for stretching and relaxing before driving to Colorado. We would barely walk once we reached our hotel in CO after sitting all day in a car. Not the wisest thing to do after hiking 10 miles into the Canyon. Remember, the hike down is not as difficult as the hike back up! A 10 mile hike in South Texas is a very different hike from 10 miles into the Grand Canyon. A trail that is 12 miles one-way hike along the Canyon can take you 7 hours. Err on the side of caution when choosing a trail. Also, you should not attempt to hike down to the River and back in one day! You will need to camp overnight to accomplish this and that requires a permit! You’ll need to reserve a campsite at Cottonwood Campground which is halfway down the Kaibab Trail, the most difficult of the North Rim trails. These are only 4 of the 13 trails available at the North Rim, listed in order of difficulty. The two Cape Trails can be done in one day, but you’ll need to drive to each trail-head. A great first day hike is the Transept Trail. It begins at the Lodge and ends at the General Store, so you get acquainted with the area. Plus, walking around the rim (named The Transept) when you first arrive will help you acclimate to the elevation, especially if you’re visiting from somewhere near sea level. There are a few sloped areas, but its mostly a flat trail. It’s an easy 2 mile one-way walk to the General Store. If you need to stock up on refreshments, snacks, or have a need to check your email, this is the time to do it! We discovered this is the only area where cell service was strong enough to get online. But its slow internet, so be patient. But you’re there for nature, not email, so that shouldn’t be a problem, right? You’ll need to drive a few minutes to reach this trail. There is a small parking lot at the trail head. Before the parking lot is another trailhead for the Cliff Spring Trail (0.4 mile hike to the Cliff Spring) and before that is the Walhala Overlook about a mile north of the parking lot. You can easily do all three. We only hiked the Cape Royal trail because we planned on doing another one somewhere else on the same day. Cape Royal is a perfect trail for those who are not looking for a difficult hike but want great views of the Grand Canyon. It’s only a 0.8 mile round-trip hike. At the end of the hike are signs describing what visitors are seeing in the Canyon. Before you reach the end, Cape Royal, there is a platform to give visitors a better view of the Angels Window. If you look down you can glimpse the Colorado River, too. Before getting back into your car, stop by the Wedding Site, near the picnic area. That’s quite a wedding backdrop! After visiting Cape Royal, we drove back about 2 miles, past Walhalla Overlook, to the Cape Final Trail. There isn’t a parking lot, but a visible dirt area where you can park off of the road. It was still late morning when we arrived and there were only two or three other cars. Cape Final Trail is mostly a tree-covered trail until you reach the rim of the Canyon, making it less hot than some other hiking options. It’s a 4.2 miles round-trip hike, so be prepared to spend 2-3 hours on this trail. Unlike the Cape Royal trail, there are no guardrails on this hike so take caution when standing on the edge. We packed plenty of snacks and water so we could sit overlooking the canyon as we ate a light lunch. (Remember to leave no trace and clean up after yourself). From this trail you can see the Painted Dessert off in the distance. We saved the most difficult trail for our last full day at the Canyon. The Kaibab Trail is a black diamond level hiking trail and is the only maintained trail at the North Rim that goes into the Canyon. (1) If you plan on reaching the Colorado River, you need to reserve a campsite at Cottonwood Campground and/or Bright Angel Campground. Cottonwood is located halfway down the trail. (2) Do not plan on hiking to the River and back in one day! (3) Hiking distances vary depending on how far you plan on going into the Canyon. (4) The first part of the hike is steep and shared with donkeys. Watch your step and prepare your nose for unwanted smells! (5) There are spots to refill water bottles but may not be in operation so bring plenty of water! (6) If you have trekking poles, this is this hike to use them on. (7) There is a small parking lot at the trailhead, but it fills up fast with early morning hikers. You can avoid parking by arranging a shuttle with the front desk. The first part of the hike is steep and shared with donkeys. Its not very difficult, though. There is a great place to stop, catch your breath, drink water and have a snack before continuing further or turning around. This part of the Grand Canyon reminds me of the Angels Landing view in Zion National Park. This is where the donkeys’ journey ends and a spot to possibly fill up your water bottles. Its also a common turn-around location along the trail. There are several switch-backs after this point,so if you’re not an experienced hiker or in extremely good shape (like this one couple we encountered), now may be a good time to turn around. If you’re feeling tired, now is the time to turn around. The hike only becomes hotter and more strenuous from here. Know your strengths and abilities and choose wisely. It’s a also nice spot to take a short break and take in the immense size of the canyon. The Springs are more like a trickle than a roar (unless we were meant to go further). We were definitely disappointed after a very long, hot hike. We were expecting rushing water or enough to get in and cool off. We could hear water as we approached the waterfall (pictured above) and were very excited. But, there were tiny pools of water and we definitely waded into them gladly! There were also picnic tables and a very smelly restroom so it was a great rest spot. As tired as we were we knew we couldn’t stay too long. It was only going to get hotter and we had the return trip to endure. The last thing you want is to be hiking up the canyon in extreme heat or darkness. It was a good thing we headed back when we did, too. As we made our way up, we could hear a storm off in the distance. Have you ever heard thunder while in a canyon? Loudest thunder you’ll ever hear. Best motivation to keep moving, though! It also rained on us, which was a blessing in disguise. It dropped the temperature and kept us cool, meaning we had less water breaks. To catch sunrise over the Grand Canyon, you’ll need to drive to Point Imperial. It’s 11 miles from the North Rim Visitor’s Center, so factor in the time it’ll take to drive there into when you need to wake up and leave the Lodge. There is a small parking lot and a short trail to an overlook. The Pocket Map at the Visitor’s Center will have the exact location and park rangers can help you with directions. 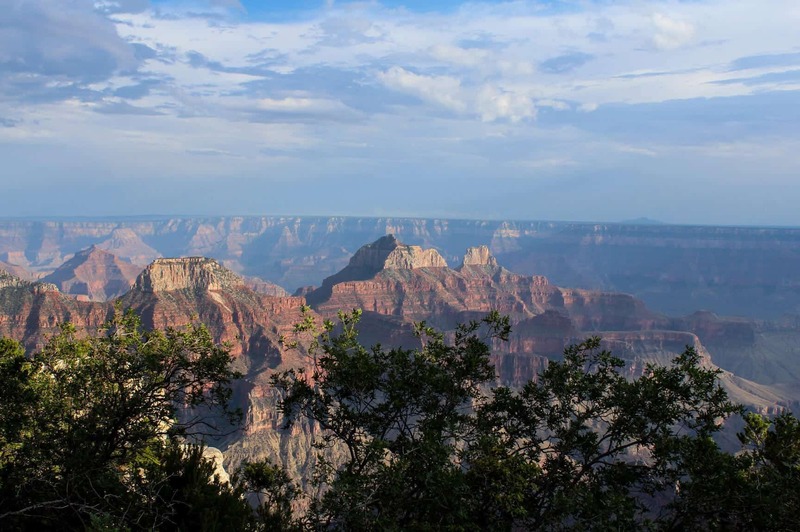 Also, wifi and cell service is limited at the North Rim, so if you can’t look up the time for sunrise, ask a park ranger and they’ll be able to provide that information. There weren’t as many people as I expected, maybe four taking photos and three more just to view. If you’re bringing a tripod, keep in mind that there is a railing between you and the canyon along the overlook. Either bring a tall tripod for the right vantage point, or a gorilla pod that can wrap around the railing. Tip: Try watching sunrise before your last day. You never know what the weather will bring during your stay. We decided to catch the sunrise one our last day and it was extremely cloudy. We were lucky the sun came out at all for our sunrise. I was hoping for warm colors painted on the sides of the canyon walls, but it was too cloudy. Since I didn’t have a tripod with me, my picture taking capabilities were also limited. If we had another day, I would have tried again. Watch sunset in comfort from the Lodge, but arrive early for the good seats! There are three options for Lodge Viewing: inside the Lodge’s Sun Room, on the West Terrace, or the East Terrace. If you do not plan on taking photos of sunset, grab one of the leather couches in the Sun Room and wait for the show. If you want photos, show up at least an hour before sunset to get one of the chairs in the front row on the East Terrace. The further away from the Sun Room is going to be the best spot so the building won’t be in your way. We never sat on the West Terrace because it is smaller with less seating options. If you’re lucky enough to get a chair or a table on the East Terrace, you may get food and drink service while you wait. We usually had beers and ate a later dinner. Another option is to buy a drink from the Roughrider Saloon and bring it to the Terrace. Remember to be courteous to those watching behind you. Don’t sit on the ledge for the entire sunset. You may be in the way of other’s photos. Watch sunset from an overlook: Bright Angel Point or the Lookout Below the West Terrace. Between the two, Bright Angel Point would be your best option. The other lookout point is lower and sunset may be blocked by canyon walls. We always watched from the Lodge, so I can’t say for sure. One night we were able to watch a storm falling on the other side of the Grand Canyon during Sunset. The weather is dramatic and changes quickly at the Canyon so you never know what you might witness. We also had a fantastic lightning show one night while eating in the Dining Room. Even the staff were watching the lighting streak across the sky and light up the canyon. Then we’d all jump a little as the thunder echoed off the canyons walls. Built in 1928, the Lodge at the North Rim is where you’ll find restaurants, shops, and views of the Grand Canyon at sunset. Native wood and Kaibab limestone was used to construct the original Lodge. A fire in the 1930’s devastated most of the Lodge, which was rebuilt using original materials, but scaled back in grandeur. There used to be second-story observational deck. The Lodge was designated a National Historic landmark in 1987. The Restaurants available at the Lodge include (1) the Dining Room, (2) Deli in the Pines, and (3) Roughrider Saloon and Coffee Shop. The Dining Room is the most expensive meal option, but its very good. To eat dinner at the Dining Room, you’ll need to make a reservation. We usually called for a reservation the day before. Breakfast at the dining room has both menu options and a nice buffet. For more information about the different dining options, click here. The Lodge is also where you’ll go to watch sunset and learn about California Condors. This giant bird was close to extinction in the early 1900’s. Today the population is close to 500 with help from the U.S. Fish and Wildlife Service and partnering zoos. Keep in mind, we drove to the Grand Canyon so we had enough space in our car to carry all of these things. We were also staying in a cabin, not a campsite. If you’re camping, you’ll obviously need more gear and food. Have you been to the Grand Canyon? What’s your favorite spot? Share your thoughts, tips, and ideas in the comments!